In November this year, 20,000 visitors will travel to Dublin from all over the world. Companies like Google, Facebook and Amazone visit The Summit each year. MoreApp will participate in the Alpha program. This program brings great startups together with the people who can take them to the next level. The organization of The Summit says: "This year, we're going even further." Why MoreApp got chosen for this special treatment? MoreApp is a Dutch startup. In two years time they build an app that even Silicon Valley does not have. Every company needs it. Think of all the paper forms companies still use. Like work orders, audits and surveys. With this app one can convert all paper forms to mobile forms. With a smartphone or tablet, everyone has access to every form at any location, even an own device can be used. All frustration that come with paper forms can be thrown overboard. 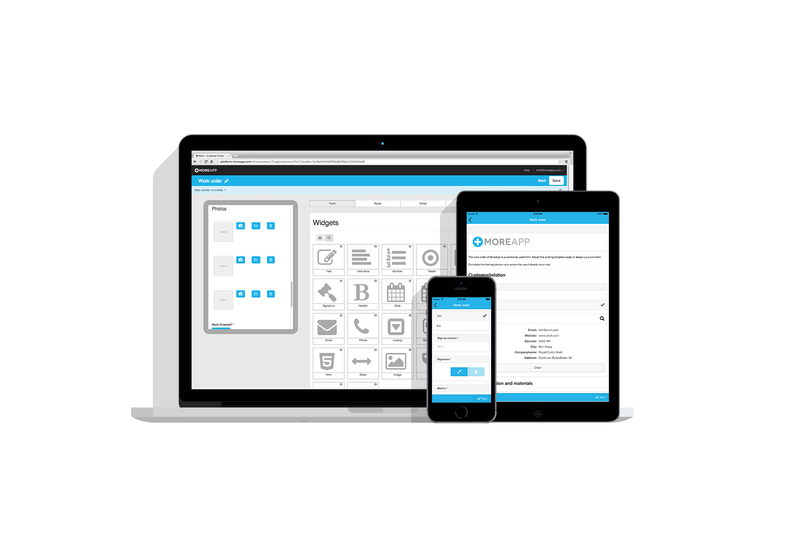 Everyone can design and manage their own forms with the new tool that MoreApp has created. People who are not trained as a software engineer can make any form they want without explanation. The product is that simple. A wide variety of elements like photos, barcode scanning, adding a signature or text headers can be added with the intuitive drag&drop form builder. MoreApp works with all functions of the mobile device. With this, we are at the beginning of a new generation of software. Each form is self-manageable. The generated data arrives immediately at the office and is always accessible in a part of MoreApp’s secured cloud. The data is uniform, legible and validated. Which saves errors and time at the office. The data can be exported or integrated with other software through API’s. Groups can be managed easily by adding colleagues and create different user groups. These groups get specific access rights to the platform or only the app. An unlimited number of users and forms can be managed and there is no monthly commitment. MoreApp has a pay-per-use cost model as you pay per form sent to your database. To conclude, business processes can be optimized with this generic tool for mobile data capturing.